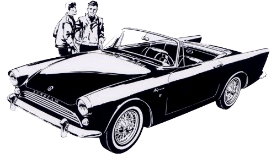 The Sunbeam Alpine Owners Club Ltd. is able to process requests from owners who are required by an Insurance company to produce evidence of the value of their Alpine. The valuation will be agreed between the owner and either a committee member of the Sunbeam Alpine Owners Club Ltd. or an Area Representative nearest to the owner. This service is free to members of the club and is also available to non members when a fee of £25.00 (Twenty Five Pounds) is payable. In both cases we reserve the right to charge reasonable travelling expenses, if an inspection of the Alpine by a committee member is necessary. The insurance companies will not accept valuations based on the cost of the car plus restoration costs. Please email the Webmaster for the address to send the cheque to. We will then allocate your request to the Registrar. Please make cheque payable to: Sunbeam Alpine Owners Club Ltd. The evidence will take the form of a letter issued on the club's headed letter paper addressed to the owner. NOTE .We do not give valuations on Alpines which will be advertised for sale.